Mutations in Pfkelch13 and Pfplasmepsin2/3 gene amplification are well-established markers for artemisinin and piperaquine resistance in Plasmodium falciparum, a widespread problem in the Greater Mekong Subregion (GMS). The Plasmodium vivax parasite population has experienced varying drug pressure dependent on local drug policies. We investigated the correlation between drug pressure from artemisinins and piperaquine and mutations in the P. vivax orthologous genes Pvkelch12 and Pvplasmepsin4 (Pvpm4), as candidate resistance markers. Blood samples from 734 P. vivax patients were obtained from Thailand (n = 399), Lao PDR (n = 296) and Cambodia (n = 39) between 2007 and 2017. Pvkelch12 and Pvpm4 was amplified and sequenced to assess gene mutations. To assess PvPM4 gene amplification, a Taqman® Real-Time PCR method was developed and validated. Selection of non-synonymous mutations was assessed by its ratio with synonymous mutations (Ka/Ks ratios). Mutation rates were compared to the estimated local drug pressure. Polymorphisms in Pvkelch12 were rare. Pvkelch12 mutations V552I, K151Q and M124I were observed in 1.0% (7/734) of P. vivax samples. V552I was the most common mutation with a frequency of 0.7% (5/734), most of which (4/5) observed in Ubon Ratchathani, Thailand. Polymorphisms in Pvpm4 were more common, with a frequency of 40.3% (123/305) in 305 samples from Thailand, Lao PDR and Cambodia, but this was not related to the estimated piperaquine drug pressure in these areas (Pearson’s χ2 test, p = 0.50). Pvpm4 mutation V165I was most frequent in Tak, Thailand (40.2%, 43/107) followed by Pailin, Cambodia (43.5%, 37/85), Champasak, Lao PDR (40.4%, 23/57) and Ubon Ratchathani, Thailand (35.7%, 20/56). Pvpm4 amplification was not observed in 141 samples from Thailand and Cambodia. For both Pvkelch12 and Pvpm4, in all areas and at all time points, the Ka/Ks values were < 1, suggesting no purifying selection. A novel real-time PCR-based method to assess P. vivax Pvpm4 gene amplification was developed. Drug pressure with artemisinins and piperaquine in the GMS was not clearly related to signatures of selection for mutations in the P. vivax orthologous resistance genes Pvkelch12 and Pvpm4 in areas under investigation. Current resistance of P. vivax to these drugs is unlikely and additional observations including analysis of associated clinical data from these regions could further clarify current findings. The online version of this article ( https://doi.org/10.1186/s12936-019-2749-3) contains supplementary material, which is available to authorized users. Anti-malarial drug resistance is a threat for the elimination of falciparum malaria in the Greater Mekong Subregion (GMS) which includes Cambodia, Lao PDR, Myanmar, Thailand, and Vietnam . For over a decade artemisinin-based combination therapy (ACT) has been the first-line treatment for uncomplicated Plasmodium falciparum malaria . The artemisinin-based combinations deployed in the GMS since 2001 include artesunate-mefloquine (AS-MQ), dihydroartemisinin-piperaquine (DHA-PPQ) and artemether-lumefantrine (AL). Cambodia was the first country to deploy AS-MQ in 2000. Treatment failure in falciparum malaria was first reported 4 years later in 2004 . DHA-PPQ was introduced in Cambodia in 2003 and treatment failure was first reported in 2010 . Thailand started implementation of AS-MQ in 1990 and first reported increased treatment failure in 2010. DHA-PPQ was more recently introduced in Thailand and increased treatment failure was recently observed in a northeastern province close to the Cambodian border in 2015–2016 (unpublished). Countries were stratified according to their first-line treatments for P. vivax (chloroquine in Lao PDR and Thailand; ASMQ + primaquine in Cambodia), as well as according to the first-line treatment for P. falciparum (AL in Lao PDR, DHA-PPQ in Thailand, ASMQ in Cambodia) . Compared to P. falciparum, P. vivax is geographically the most widespread human malaria with over 2.5 billion people living at risk of infection . Vivax malaria has a high prevalence in South-East Asia, Western Pacific regions, and Central and South America [6, 7, 8]. In the GMS the proportion of P. vivax and P. falciparum cases are estimated as 34% and 66%, respectively . In addition to clinical cases, prevalence of P. vivax in asymptomatic parasite carriers, as assessed by PCR methods, is also high, with an average of 30% . In Lao PDR, mixed infections of P. vivax and P. falciparum account for up to 6.5% of clinical malaria cases . Therefore, the P. vivax population will be exposed to ACT used for treatment of falciparum malaria, even where chloroquine is still the first-line drug for P. vivax treatment . Drug pressure from ACT on the P. vivax parasite population is higher in Cambodia where ACT is the first-line treatment for P. vivax. Single Nucleotide Polymorphisms (SNPs) at multiple loci in the propeller region of the P. falciparum kelch (Pfkelch13) gene are the main genetic marker for artemisinin resistance and have reached high frequencies in most countries of the GMS. Examples are the nonsynonymous mutations in Pfkelch13; C580Y, R539T and Y439H, with C580Y over time becoming the most dominant mutation [11, 12, 13, 14, 15]. The orthologous gene for Pfkelch13 in P. vivax (Pvkelch12) has been identified and mapped onto chromosome 12 (accession number PVX_083080, kelch12 propeller) with a nucleotide and protein sequence length of 2139 bp and 712 amino acids, respectively (Fig. 1). Few Pvkelch12-associated nonsynonymous mutations have been identified in P. vivax isolates in Cambodia . In addition to artemisinin resistance, countries in the GMS have witnessed more recently the emergence and spread of piperaquine resistant P. falciparum. Gene amplification of the P. falciparum plasmepsin 2 and 3 genes (Pfplasmepsin2/3) has been identified as a marker for piperaquine resistance [3, 17, 18]. The orthologous gene for Pfplasmepsin2/3 in P. vivax is P. vivax plasmepsin4 (Pvpm4), identified and mapped for P. vivax reference strain Sal-1 located on chromosome 13 (accession number PVX_086040). It has a sequence length of 1353 bp and codes for a 450 amino acids protein . Recently genetic variation in Pvpm4 has been reported from Malaysia, Thailand and Indonesia, in particular the nonsynonymous mutation Pvplasmepsin4 I165V . There is no information on copy number variation (CNV) in Pvpm4 in P. vivax field isolates. In the current study, gene polymorphisms in Pvkelch12 and Pvpm4 were accessed in P. vivax field isolates from three countries of the GMS (Thailand, Lao PDR and Cambodia), and related this to the estimated drug pressure on the parasite population. For this, a real-time PCR method was developed and optimized for Pvpm4 CNV analysis in field isolates. Whole blood samples from both clinical cases and asymptomatic carriers of P. vivax were obtained in Thailand (Ubon Ratchathani and Tak), Lao PDR (Champasak, Savannakhet, Xekong and Salavan) and Cambodia (Pailin) between 2007 and 2017. Genomic DNA was extracted from whole blood by using QIAamp® DNA Blood Mini Kit (Qiagen, Germany) and purified DNA was stored at − 20 °C until further use. The study was approved by the Ethics Committee of Faculty of Tropical Medicine, Mahidol University, Thailand (EC approval number MUTM 2017-037-01). Primers designed for Pvkelch12 and Pvpm4 genes were based on the P. vivax Sal-1 genome (Table 1). DNA of the Pvkelch12 and Pvpm4 genes was amplified by semi-nested PCR (Table 1). For PCR amplification the primary and secondary reaction volumes were 25 and 100 µl, respectively. The amplified PCR products were further purified by using PCR purification kit, FavorPrep™ (Favorgen, Taiwan), following standard manufacturer’s instructions. The specificity of all primer pairs designed for this study was tested against both human and non-human primate Plasmodium species, and no cross-reactivity was observed with non-P. vivax species, to exclude cross-species contamination of PCR products. The nucleotide sequences of Pvkelch12 and Pvpm4 genes obtained in this study have been submitted to GenBank database under the accession numbers MK513662-MK513680 and MK513681-MK513709, respectively (Additional file 1). Purified products from the secondary PCR were subjected to DNA sequencing (Macrogen, Korea). Gene sequences of the PCR amplification products of Pvkelch12 (accession number: XM_001614165.1, Sal-1; PVX_083080) and Pvpm4 (accession number: XM_001616821.1, Sal-1; PVX_086040) were confirmed using the NCBI’s Blastn and Blastx programs. Subsequently, gene polymorphisms were assessed by comparison with the reference sequences using BioEdit v7.2.5. The ratio of nonsynonymous site (Ka) to synonymous single nucleotide polymorphisms (Ks) or Ka/Ks ratios was assessed to identify signatures of gene selection in the parasite population, using the online available Ka/Ks Calculator (https://kakscalculator.herokuapp.com/calculate.action). This provides the Jukes-Cantor (JC) and Kimuras-two parameters (K2P) as measures of purifying selection [20, 21]. Differences in categorical variables were examined using Pearson’s Chi squared test. A method to assess Pvpm4 CNV was developed. For this specific primers for Pvpm4 and Pvβ-tubulin (internal control in the real-time PCR reaction) were designed based on the P. vivax Sal-1 (PVX_086040) reference gene (Table 1). BLAST analysis of amplified fragments showed a high alignment score of 99% for Pvpm4 and 91% for Pvβ-tubulin sequence identity compared to the reference P. vivax Sal-1 genome. The regions identified for PCR amplification were highly conserved and specific for P. vivax. Primers were labelled with 6-carboxyfluorescein (6-FAM) and 6-carboxytetramethyl-rhodamine (TAMRA) as quencher. CNV was assessed by QuantiTect multiplex PCR NoRox kits (Qiagen, Germany) following standard manufacturer’s instructions. Pvpm4 plasmids with one and two copy numbers were used as calibrators and positive controls. These plasmids were prepared by cloning of plasmid vectors following standard manufacturer’s instructions (pGEM®-T Easy Vector Systems, Promega, USA). Each PCR reaction contained a total volume of 10 µl including 2 µl of genomic DNA as the template. PCR master mix was prepared using 1 × QuantiTect Multiplex (NoRox), 0.4 µM of both forward and reverse primers, and 0.2 µM of TaqMan probe and RNase-free water. The thermocycler (Rotor-Gene Q 5plex System, QIAGEN) profile was: initial denaturation at 95 °C for 15 min, 50 cycles of denaturation at 95 °C for 15 s followed by annealing at 58 °C for 1 min, and final extension at 72 °C for 5 min. The detection threshold cycle (Ct) was calculated by using the 2−ΔΔCT method where, ΔΔCt = (Ct of Pvpm4 –Ct of Pvβ-tubulin) of sample—(Ct of Pvpm4 –Ct of Pvβ-tubulin) of Pvpm4 plasmid clone. The specificity of the real-time PCR method was validated using isolated human DNA from healthy subjects (n = 50), patients with P. falciparum (n = 50) and P. vivax (n = 50). This confirmed that the used primers were highly specific to P. vivax without any undesired amplification of host DNA or P. falciparum DNA. Pvpm4 gene amplification (2 or more) was called when 2−ΔΔCt exceeded 1.5, with a Ct value acquired after less than 35 cycles. Analysis of Pvkelch12 in P. vivax strains from Thailand, Lao PDR and Cambodia showed nonsynonymous mutations as 1.0% (7/734) of samples, at codons Val552Ile (V552I), Lys151Gln (K151Q) and Met124Ile (M124I). The V552I mutation was most frequent, followed by K151Q and M124I. V552I has an overall prevalence of 0.7% (5/734) and was observed in Ubon Ratchathani, Thailand (1.4%, 4/286) and Champasak, Lao PDR (0.3%, 1/296). The K151Q and M124I mutations were only observed in Tak, Thailand (0.9%, 1/113 and 0.9%, 1/113) (Fig. 2). Assessment of Pvpm4 showed nonsynonymous mutation in 40.3% (123/305) of samples, with Val165Ile (V165I), mostly observed in Pailin, Cambodia (43.5%, 37/85) followed by Champasak, Lao PDR (40.4%, 23/57), Tak, Thailand (40.2%, 43/107) and Ubon Ratchathani, Thailand (35.7%, 20/56) (Fig. 3). The observed mutation frequencies in the Pvkelch12 were not significantly different in regions with ACT as first-line treatment for P. vivax (Cambodia) compared to regions with chloroquine as first-line treatment (Thailand and Lao PDR) (Pearson’s χ2 test, p = 0.38). There was also no association between the frequency of Pvpm4 gene polymorphisms and deployment of DHA-PPQ (Cambodia versus Thailand and Lao PDR) (Pearson’s χ2 test, p = 0.50). Ratios of nonsynonymous and synonymous mutations were used to identify indicators of selection in Pvkelch12 and Pvpm4. In total, 37/734 (5.1%) samples contained a SNPs in Pvkelch12; multiple SNPs in a single strain were not observed. Mutations included three nonsynonymous mutations at codons M124I, K151Q and V552I and ten synonymous mutations at codons N57N, I248I, K310K, I332I, T334T, I340I, S350S, D359D, L365L and T401T (Additional file 2). In Pvpm4, 141/305 (46.2%) samples contained four genetic mutations. This included one nonsynonymous mutation at codon V165I and three synonymous mutations at codon Q74Q, G141G and F364F (Additional file 3). The ratios of Ka/Ks for Pvkelch 12 and Pvpm4 gene were < 1 for whole sample set, as well as for parasite from the individual countries (Thailand, Lao PDR and Cambodia). This suggests absence of purifying selection in these genes (Tables 2 and 3). 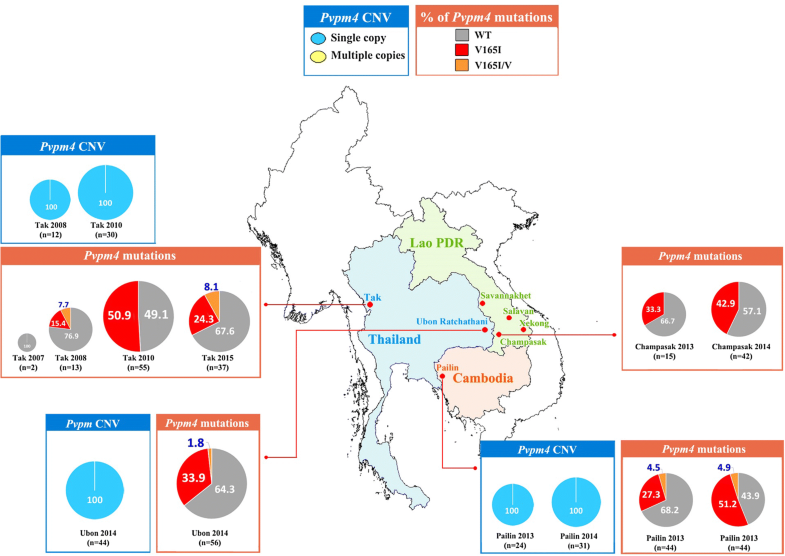 CNV in Pvpm4 was assessed in 141 P. vivax samples from Ubon Ratchathani, Tak (Thailand) and Pailin (Cambodia) obtained between 2008 and 2014. Gene amplification in Pvpm4 was not observed in any sample under investigation (Fig. 3). Details of the assessment are provided in Additional file 4. Resistance in P. falciparum to both artemisinin and piperaquine is now widespread in Cambodia, northeastern Thailand and Southern Lao PDR, and genetic epidemiological studies have identified that this has spread from a single parasite lineage emerging from western Cambodia . In Cambodia, similar drug pressure from DHA-PPQ on the P. vivax as on the P. falciparum parasite population can be expected, since DHA-PPQ is also first-line treatment for vivax malaria in this country , and because of the frequent co-infection with the two Plasmodium species . Thus, vigilance is warranted for surveillance of resistance in P. vivax towards these drugs. This surveillance is hampered by the difficulty to perform therapeutic efficacy studies in vivax malaria, since recrudescent infections denoting drug resistance are difficult to distinguish from relapse infections from liver hypnozoites. Also, compared to P. falciparum, methods for in vitro drug sensitivity testing for artemisinins and piperaquine are not well established in P. vivax. Molecular markers for drug resistance in P. vivax would facilitate surveillance, but no markers have been identified to date. A first step for identifying novel markers would be to study orthologous resistance genes of P. falciparum in P. vivax, and establish whether mutations in these genes are selected for according to the level of drug pressure. The current study focused on Pvkelch propeller region mutations as a putative marker for artemisinin resistance and Pvpm4 mutations and amplification for piperaquine resistance. The family of Plasmodium KELCH proteins consist of six KELCH motifs in the propeller domain, linked through a Broad-Complex Tramtrack and Bric-a-Brac/Pox virus and Zinc finger (BTB/POZ) domain, to the transcription factor/nuclear export subunit protein 2 (Tho2) domain. The kelch gene is highly conserved across different Plasmodium species, with a ratio between nonsynonymous and synonymous mutations (Ka/Ks ratio) around 1 in drug sensitive Plasmodium populations [22, 23]. SNPs in the propeller regions of Pfkelch13 are closely linked to the slow clearance P. falciparum phenotype denoting artemisinin resistance. Although only single mutation are commonly observed in the propeller region of Pfkelch13 gene, study has shown that multiple mutations are also tolerated . Selection of Pfkelch13 mutations in areas of artemisinin resistance results in a Ka/Ks ratio of around 102 in countries in the GMS [11, 23]. In Africa, nonsynonymous mutations in Pfkelch13 are observed in low frequencies (few percent), without signatures of selection, likely denoting a background mutation rate in the gene . Overall mutation rates for P. falciparum are in the range of 1–10 × 10−9 per nucleotide site per mitotic division [25, 26, 27]. Depending on the fitness loss induced by the mutation, subsequent drug pressure can select for the drug resistant gene, increasing its frequency above background and increasing the Ka/Ks ratio . Present study indicates that only 0.95% of parasites harbored nonsynonymous mutations in Pvkelch12, whereas synonymous mutations were observed in 4.1% of parasites. This was not different between countries. These findings are in agreement with a previous report showing limited genetic diversity of Pvkelch12 in Southeast Asia . Both the low frequency and the low Ka/Ks ratio suggest that there is currently no selection of Pvkelch12 mutations in P. vivax in the study areas in Thailand, Cambodia and Lao PDR, despite the widespread exposure to ACT. Although it is not clearly understood whether Pvkelch12 plays a role in P. vivax resistance to artemisinins, absence of Pvkelch12 mutations corroborates the absence of clinical resistance to artemisinins in these areas. Of the Pvkelch12 mutations identified during current study, mutations at position V552I and M124I have been reported previously (Additional file 5); the G581R mutation previously reported from China was not observed in the current study [28, 29, 30]. The orthologous Pfkelch13 mutations at positions 555, 126 and 595, have not been described in association with artemisinin resistance in falciparum malaria. Vice versa, none of the currently validated artemisinin associated Pfkelch13 mutations have to date been described in the orthologous positions in Pvkelch12 . Plasmepsins I, II, III, and IV in Plasmodium constitute a group of histo-aspartic proteases aiding the hydrolysis of haemoglobin in the plasmodial food vacuole, providing amino acids as food for the erythrocytic stage of P. falciparum. Gene amplification of Pfplasmepsin2 and Pfplasmepsin3 are strongly associated with resistance to piperaquine in falciparum malaria. A potential mechanism is interference with the mechanism of action of this drug, which is inhibiting conversion of toxic haem moieties to nontoxic haemozoin during haemoglobin digestion . Frequencies of CNV in the P. vivax orthologous gene Pvpm4 have not been studied before, and a method for assessing Pvpm4 copy numbers was developed for the purpose of this study. However, Pvpm4 gene amplification was not observed in any of the P. vivax samples from Thailand and Cambodia. In contrast, SNPs in Pvpm4 were frequently observed, in particular the nonsynonymous mutation V165I (123/305 or 40.3% of samples). The mutation has been described previously in P. vivax from Malaysia (Sabah) and Thailand . However, it is unlikely that this mutation is related to piperaquine drug resistance, since its frequency was not associated with the level of piperaquine drug pressure (low in Thailand, high in Cambodia) (Table 3). Although the current study did not show signatures of selection for the identified mutations in Pvkelch12 and Pvpm4, it is warranted to continue monitor these mutations over time and over a larger geographical area, including Vietnam and Myanmar. In addition, future studies on potential molecular markers for resistance in P. vivax can include associations with the clinical phenotype (parasite clearance rate and treatment failure) and protein level analysis of Pvkelch12 and Pvpm4. Present study assessed mutations in the P. vivax orthologous resistance genes Pvkelch12 for artemisinin resistance and Pvpm4 for piperaquine resistance. Although nonsynonymous mutations were observed, the frequency was low, and not higher than synonymous mutations in the same genes. Pvpm4 gene amplification was not observed. 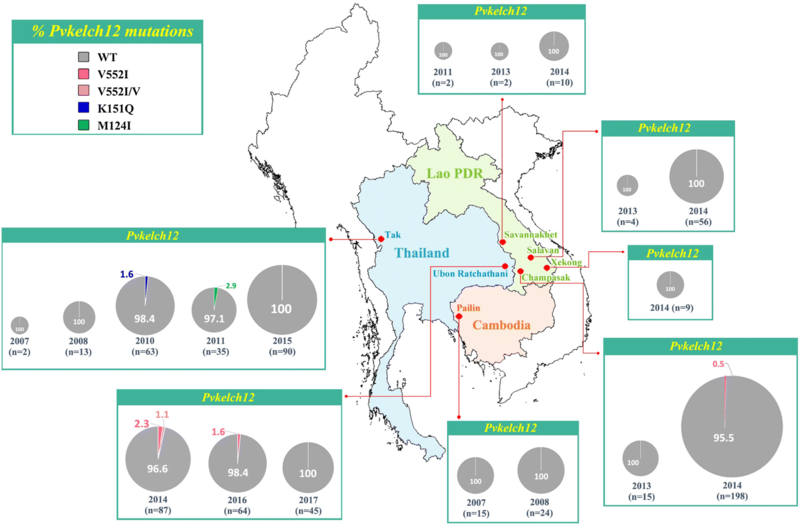 Current resistance of P. vivax in Thailand, Lao PDR and Cambodia to these drugs is unlikely. 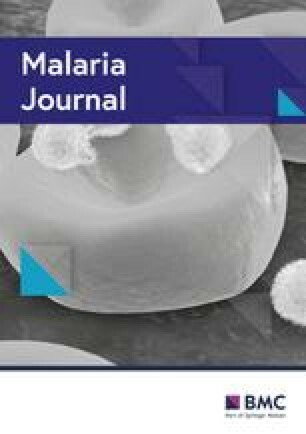 Nonetheless, additional observations, validations and analysis of associated clinical data from these malaria endemic zones could further help clarify current findings. MI, NJW, and AMD designed the study. JD undertook the laboratory experiment. RT, MM, CN, LS, MD, TP, FN collected the samples. JD, MI, AMD, VBM, NPD, and NJW conducted data analysis. JD wrote the first draft. All authors read and approved the final manuscript. This study was supported by Mahidol University, the Thailand Research Fund, Thailand and the Wellcome Trust of Great Britain. Selected data are provided in Additional files. Additional dataset generated during the current study are available from corresponding author on reasonable request. The protocol of this study was reviewed and approved by the ethical review board of Faculty of Tropical Medicine, Mahidol University, Thailand (MUTM 2017-037-01). This work was funded by the Thailand Research Fund, Thailand and the Wellcome Trust of Great Britain. Additional file 1. Accession numbers of nucleotide sequences and sequence IDs of Pvkelch12 and Pvpm4 genes obtained from GenBank database. Additional file 2. Synonymous mutations in Pvkelch12 gene Thailand, Lao PDR and Cambodia. Additional file 3. Synonymous mutations in Pvpm4 gene Thailand, Lao PDR and Cambodia. Additional file 4. The distribution of Pvpm4 copy number variations in each sample from 3 study sites with geometric means with 95% confidence interval of Pvpm4 CNV. Additional file 5. Comparison of Pvkelch12 mutations of this study to previous publications. WHO. World malaria report 2017. Geneva: World Health Organization. 2017. https://www.who.int/malaria/publications/world-malaria-report-2017/report/en/. WHO. World malaria report 2014. Geneva: World Health Organization. 2014: https://www.who.int/malaria/publications/world_malaria_report_2014/en/. WHO. World malaria report 2015. Geneva: World Health Organization. 2015. https://www.who.int/malaria/publications/world-malaria-report-2015/en/. WHO. World Health Organization Global Malaria Programme. 2018. http://apps.who.int/iris/bitstream/handle/10665/274362/WHO-CDS-GMP-2018.18-eng.pdf?ua=1.